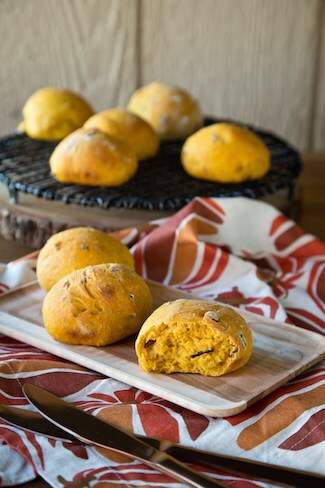 Make-Ahead Pumpkin Nut Dinner Rolls | Good. Food. Stories. No matter what projects and deadlines are on the docket, the busy person’s day is by necessity a divided one: we start a task in the morning, leave emails in draft form while we run out to meetings or get sidetracked by small crises, then return to our desks and computers later on to finish things out. Or sometimes we don’t get back to finishing that email, putting the final touches on a presentation, or even frosting that cake until the next morning. 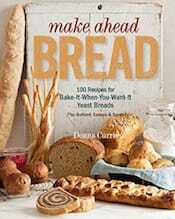 The strategy of doing a little bit one day and finishing up your efforts the next day is the idea behind the new book Make Ahead Bread: 100 Recipes for Melt-in-Your-Mouth Fresh Bread Every Day , by Donna Currie. If you’re going to take one lesson away from Make-Ahead Bread, I hope it’s the calm realization that bread making doesn’t have to be a fussy affair. It’s true that the intimidation factor is high for novice bakers because of the necessity of working with yeast (the element that Donna calls the “stray cat loose in the building … unpredictable and hard to tame.”) And she does specify a few brands by name, like Red Star active dry yeast, and like any good baker, recommends that you get in the habit of weighing your ingredients instead of measuring them by volume. But for the most part, Donna’s recipes let you be a little loosey goosey with the process. Dough is mixed, kneaded (by hand or with a stand mixer, using your eyes and hands as a guide rather than relying on specific times), and left to rise once at room temperature. Then it’s either shaped for baking or just left to do a second rise overnight in the fridge. Start with basic pizza dough, which gets mixed and kneaded within a zip-top bag, and work up to cinnamon croissants or feta, rosemary, and sun-dried tomato turnovers. I’m especially appreciative of the suggestions for using up the odds and ends of loaves and leftover rolls, such as breakfast stratas and bread puddings, homemade croutons, and a host of butters and spreads to make you want to snack on bread heels until the end of time. The make-ahead strategy comes in especially handy for large gatherings like the Thanksgiving meal. Many of the rolls and shaped breads in Make-Ahead Bread can be par-baked and reheated so you can serve them warm without any sweating over advance prep work on the day of your party. For my Thanksgiving menu, I’ll be making the following pumpkin rolls (and taking Donna up on her recommendation to jazz things up with a scoop of chopped nuts in the dough). 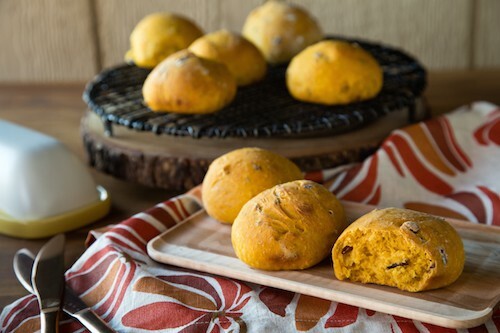 The pumpkin in these rolls doesn’t add any significant sweetness or “pumpkin spice” flavor. Its crucial role here is to add moisture (along with a pretty little side effect of gorgeous autumnal color), which helps keep the rolls soft and pliant instead of going stale or becoming too tough and chewy when reheated. They’re wonderfully comforting, especially with a swipe of salted butter or a dollop of tart cranberry spread. Come to think of it, maybe I better make a second batch. We might need them for Black Friday breakfast too. Add the flour, dry milk, yeast, salt, pumpkin, water, butter, and honey to the bowl of a stand mixer or a large mixing bowl. Mix with the dough hook attachment on low speed until a shaggy dough forms, then add the chopped nuts and knead for 3-4 minutes until smooth. You can also mix the ingredients with a spatula or electric hand mixer, then transfer to a lightly floured work surface and knead by hand. Once the dough has doubled in size, line a small (approximately 9- by 13-inch) baking sheet with parchment paper. Place the dough on a lightly floured work surface and divide into 12 equally sized pieces. Roll each piece into a ball and place on the prepared baking sheet. Cover the sheet with plastic wrap and refrigerate overnight or up to 24 hours. Take the baking sheet out of the refrigerator and remove the plastic wrap. Leave at room temperature while you preheat the oven to 350˚F. Make sure to preheat the oven for a half hour. Bake the rolls for about 30 minutes, until the tops are golden brown and an instant-read thermometer registers a 205˚F internal temperature. Let the rolls cool on a wire rack until ready to serve. Make-Ahead Thanksgiving Prep: You can make these rolls up to a week in advance. Bake them just until their tops are barely brown (25-30 minutes), then cool the rolls completely on a wire rack. 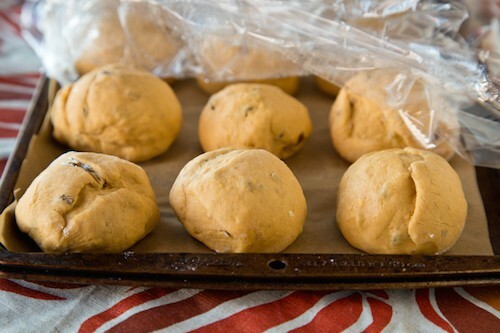 Place the cooled rolls on a clean baking sheet and freeze for about 1 hour until frozen solid. Transfer to a large zip-top bag or lidded container and keep frozen for up to 1 week. The night before you plan to serve the rolls, thaw them overnight in the refrigerator. Reheat in a 325˚F oven for 10-15 minutes, until warmed through and golden brown. Serve warm.